On Tuesday, March 27, the Oregon Department of Energy participated in one of our regular nuclear emergency exercises. 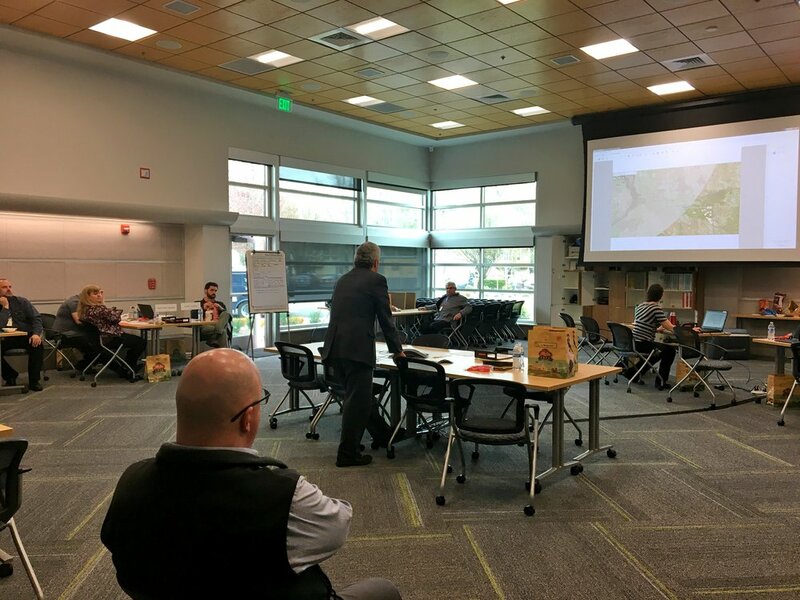 Each year, ODOE staff activate our Agency Operations Center in Salem and send staff north to Washington to simulate how we would respond in the event of an emergency at the Hanford Site or the Columbia Generating Station nuclear power plant near Richland. Both sites sit along the Columbia River, just 35 miles north of Oregon’s border. The March exercise focused on the Columbia Generating Station, and will be graded by the Federal Emergency Management Agency. In the simulated exercise, a SCRAM (the procedure used to shut down a nuclear power plant) failed after elevated levels of radiation were detected in a nearby turbine building at about 8:15 a.m. The situation escalated because they could not completely shut down the plant, and it resulted in a release of radioactivity into the nearby environment. The graded exercise followed a “dry run” we completed in February. And we’re not done yet! We’ll do a third exercise in May to practice an emergency at Hanford. Four ODOE staff members headed to Richland the day before the exercise. Of course in a real emergency, we wouldn’t have that luxury of time and a good night’s sleep. On Tuesday morning, the foursome met at a local coffee shop where they awaited deployment instructions from Salem. At about 8:45 a.m., half of the team – a radiation dose analyst and a state liaison – headed off to the Emergency Operations Facility. The other two served as public information officers and went to what is known as the Joint Information Center. All four were in contact with each other, as well as with Jenny and those at the AOC in Salem. This exercise unfolded very quickly and never slowed down. As new information became available in Richland, briefings and press conferences were held. Press releases drafted in Salem were reviewed for accuracy by the team in Richland. Each simulated exercise usually has some type of airborne release. The public officials from the three counties around Richland, as well as employees from CGS, were talking franticly – trying to figure out where the leak was coming from and how to alert citizens in the area of any protective actions. Eventually, the State of Washington put agricultural protections in place. But tests showed the radioactivity did not reach Oregon. One of the challenges our ODOE team in Richland faces is trying to determine what information is most important to Oregonians. Emergency exercises often get going at a slower pace in Salem than up in Richland. At about 8:30 a.m., Assistant Director for Nuclear Safety Ken Niles alerted us of a “site area emergency” at CGS (always noting that this is a drill, of course). We kept in close contact with Cliff and the rest of the team in Richland, and when the simulated emergency escalated, we activated our AOC at about 10:10 a.m., with it fully operational by 10:30 a.m. Around 11 a.m., the situation escalated to a “general emergency.” A general emergency is the highest level of emergency. In the AOC, it’s all hands on deck. Members of ODOE’s Nuclear Safety team, Communications team, and IT team are present, as well as additional support staff from across the agency. We also have experts from Oregon State University’s Nuclear Science and Engineering Department and Oregon Health Authority’s Radiation Protection Services, as well as a staff member from the Oregon Department of Agriculture in case an offsite release of radioactive materials were to reach Oregon. Every hour or so, the AOC holds a briefing to share the latest information with the group. Meanwhile, the Communications team sets to work drafting mock press releases, website updates, and social media posts as we would in a real emergency. We also activate a “phone team” to practice taking the calls we would expect to receive from concerned Oregonians in a real emergency. Other staff carefully track if and where a “plume” of radioactivity could travel, and whether it would reach Oregon. Meanwhile, OHA radiation monitoring teams, with assistance from the Oregon National Guard Civil Support team, practiced monitoring air, water, and soil in Umatilla County. We even deployed aircraft to practice moving samples from Umatilla County back to OSU in Corvallis for testing. At 1:30 p.m., we held a mock press conference with experts from ODOE, OSU, and OHA – we even have mock media present to ask tough questions! As our press conference wrapped up, so did the exercise itself. All in all, another successful practice run. The AOC is a well-oiled machine, and we always learn new ways to improve. We hope we never have to put our exercises in to real action, but we know that if a real accident happens at CGS or Hanford, we’ll be ready! Learn more about ODOE’s work with nuclear safety.